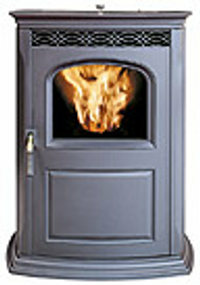 The Harman Accentra pellet stove is a modern looking unit made of cast iron. The freestanding stove has a useful tinted glass hopper lid so you can see at a glance what the fuel situation is. The Harman Accentra can produce 40,000 btu. and is rated to heat an area of 1,400 square feet. It has a heavy cast iron heat exchanger for efficient heat distribution around the home. A track system is available for the Insert to make moving it in and out easier when doing maintenance. A useful option because this unit is heavy. 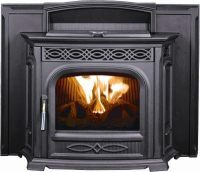 The Insert won the Hearth Products Association 'Vesta' award in 2003. For most heat settings other than maximum, the stove is capable of running without its distribution blower being turned on. This means that you can have a quiet time with a view of a good fire. The control board has some diagnostics to help isolate any problems. There is also a port where a Harman dealer can plug in a diagnostic tool. The Harman room heat sensor is 'intelligent' in that it can monitor temperature trends in the room and either speed up or slow down the stove to compensate. This provides more even temperatures than a stove which starts and stops. Heating Area 1,400 sq. ft. Burn time Freestanding 66 hrs. Insert, 76 hrs. Convection Blower Capacity Freestanding 150 cfm. Insert 180 cfm. Window Size 11 in. by 9 in. Rear Vent Height Freestanding 7.7 in. Colours Enamel finishes in Black, Charcoal, Forest Green, Goldenfire Brown, Honeyglo Brown, Metallic Blue, Mojave Red, Patriot Blue. Cast Iron Legs, can be used with the hearth pad. Track System, (makes moving the insert in and out easier for maintenance). 20 in. and 22 in. reduced height hopper. (For smaller fireplaces). Width including surround 41.8 in. 41.8 in. by 32 in. 20 in. hopper: 38 lbs. 22 in. hopper: 48 lbs. Smaller hopper sizes available to allow the Harman Accentra Insert to fit smaller fireplaces will result in shorter burn times. 20 inch hopper height -- 50 hours, 22 inch hopper height -- 64 hours. Empty the ash pan, scrape the burn pot, clean the heat exchanger surfaces. Clean and scrape the burn pot, clean the heat exchanger, clean ash from the inside of the stove, clean the combustion blower fan and internal flue. Clean fines from the fuel delivery system. If you would like to leave a review of the Harman Accentra pellet stove or pellet insert, please use the form on the contact page.